Congratulations, we’re delighted that you’re thinking about a humanist ceremony to celebrate your love and life together. We believe that marriage and civil partnerships are based on mutual love and respect. We also know that every couple is different and that is why our ceremonies are unique and personal. 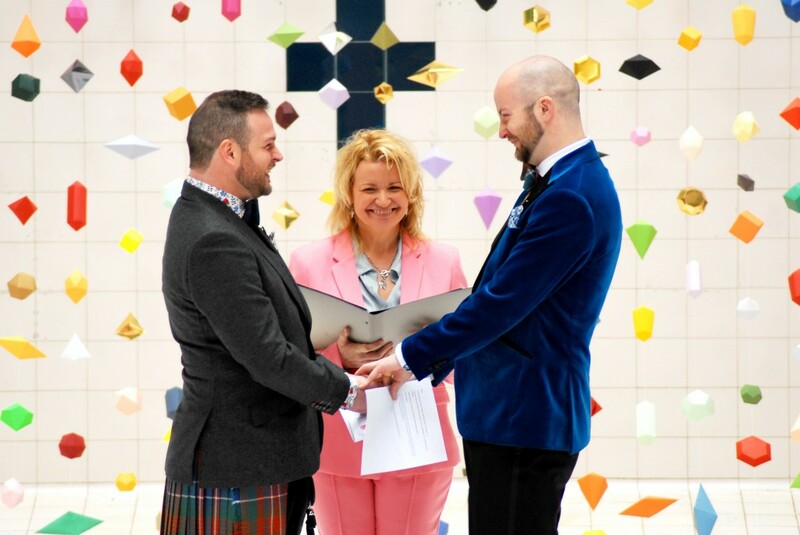 Humanist ceremonies can take place indoors or outdoors, they can be simple or elaborate, traditional or contemporary. They usually include readings, music and an exchange of rings but can also include symbolic gestures, like hand fasting. Whatever you want to do the choice is yours. It’s your love, your life together and your ceremony. Whatever you decide on, your HSS Registered Celebrant will work with you to create your perfect ceremony. One of the many benefits of a humanist ceremony is that you are involved in the writing of it. That means that on your special day the ceremony is a true reflection of your commitment to each other. Your celebrant will share your story and words with those celebrating with you; it really is as unique as the love you share. Humanist Society Scotland was granted Prescribed Status by the Scottish Government in February 2017, which means our celebrants are permanently authorised to conduct legal marriages. We are the largest and longest standing provider of humanist ceremonies in Scotland so you can be confident you’re in safe hands. All our celebrants are trained, regularly reviewed and work to our standards for ceremonies. We are also the only provider to offer the HSS Ceremony Promise. HSS Registered Celebrants are all self employed and therefore, you are advised to confirm fees with them directly. The fee you are charged will reflect the time to arrange your ceremony, a meeting to discuss it, and its preparation which includes all correspondence and communication, and of course its delivery on the day. We are a Registered Charity and Celebrants contribute part of their fee to the HSS to allow us to continue to invest in the development of humanist ceremonies and develop our campaigns and charitable work. As a guide you can expect to pay around £410 for a wedding in 2018 and possibly slightly more for future years. There may also be additional expenses such as travel costs; your celebrant will be able to advise you. We also ask that you join the HSS or your national humanist organisation if you live outwith Scotland. HSS membership is currently £43 for a couple. Membership of the HSS gives you access to the members area of our website, lets you keep up to date with all our campaigns and good work, and our local groups are a great way to meet people with similar beliefs. You can join or find out more here.